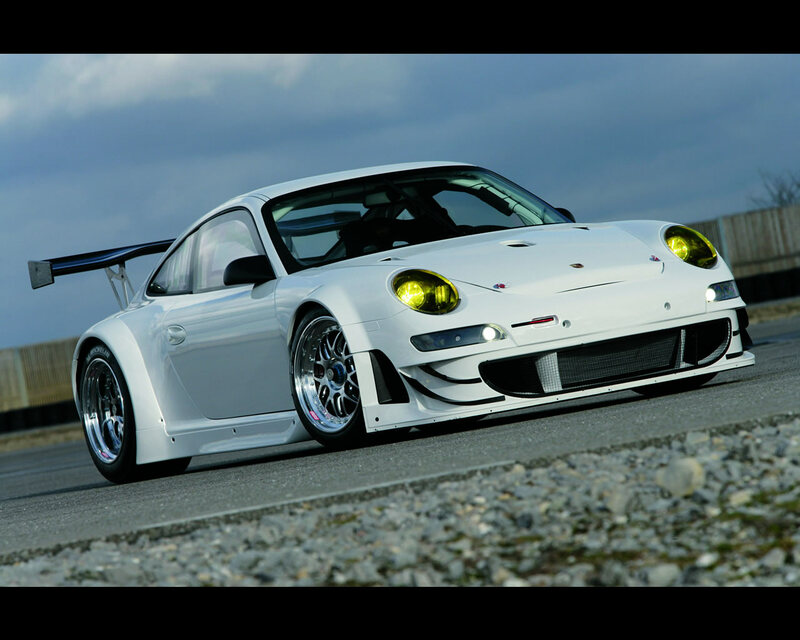 The 2008Porsche 911 GT3 RSR comes with mostly aerodynamic modifications when compared to its predecessor. In 2007, this most powerful race car based on the Porsche 911 scored wins at the 24 hours races of Le Mans and Spa as well as overall victory at the Nurburgring 24 Hours, competing in the GT2 class at international long distance races. The most distinguishing feature of the 2008 GT3 RSR is the front end; aside from the easily recognisable additional spoilers on the front apron, so-called flicks, an optimized air ducting with newly-designed side air outlets generates more down-force and reduces drag. Extensive changes to the suspension kinetics increase mechanical grip considerably. The range of possible set ups have been broadened. The water cooled 3.795 cc. boxer engine of the GT3 RSR remains unchanged apart from slight improvements to details. It delivers 465 hp (342 kW) at 8.000 rpm and delivers a maximum torque of 430 Nm at 7.250 rpm. The rev limiter kicks in at 9.400 rpm. Much of the know-how in the GT3 RSR's totally new gearbox has come from the RS Spyder sports prototype. The sequential six-speed unit, developed by Porsche engineers, is considerably lighter than its predecessor. Internal friction was substantially reduced. The clutch is three-plate carbon-fibre. The monocoque body based on the GT3 RS is made of hot-galvanized steel. There is a welded-in safety cage and the bucket-type racing seat on driver side only comes with flame-resistant seat cover. Thirty-five units were built in Weissach and delivered to customers around the world. The price of the 2008 Porsche GT3 RSR was 349.800 Euro plus VAT (Value Added Tax).